Minneapolis-based musician Clint Hoover has made more than his fair share of good CDs, the innovative acoustic jazz Dream of the Serpent Dog and the reinvented jug band blues of Take Your Time, Mr. Brown being two of the most notable. His latest CD is every bit as notable. On This Day sounds like he stepped back in time to the 1960’s and recorded an album for Blue Note Records. Even the cover art looks like it could have graced one of those timeless Blue Note LPs. A lovely selection of tunes from the likes of Dexter Gordon, Clifford Brown, and Wayne Shorter, all accompanied by some great bass and piano playing from Eric Graham and David Hupp. This set mostly showcases Clint’s beautiful chromatic playing — I believe he plays a Super 64X. He has remarkable facility with the instrument, a lightness of touch that makes his playing effortless, although I’m sure that his flair for melodic improvisation comes as a result of a lot of hard work in the woodshed. Clint also breaks out the diatonic for a rollicking version of Horace Silver’s Sister Sadie and shows that his over blow skills rank with the best of them. The record captures the atmosphere of the session perfectly and it feels as though you are right there with them in some dimly lit sixties jazz club – minus the smoke and the background chatter, of course! This is a must-have album for any fan of jazz harmonica, or really any jazz fan. File it right alongside your Stanley Turrentine and Kenny Burrell albums ready for when you need an hour of bluesy jazz harmonica from one of the best players around. There was a period in my harmonica life that I was unaware of Clint Hoover. How sad for me. A few years ago at a SPAH convention, it was decided that a seminar on jazz would be a hit with the mass of harmonica playing attendees. Five noted jazz players were enlisted to form the panel. Clint Hoover was designated as frontman for the group. I knew all of the other members, but who was Clint Hoover? The audience was seated, the players assembled in a row on stage. Clint greeted the crowd and announced a kickoff number to goose the seminar to life. Clint started the round. Oh my. It was then I found out who Clint Hoover is. I became an instant fan of this really fine jazz player. His first album, Dream of the Serpent Dog, was a joy for me to hear. Clint is the real thing as a jazz player, no ifs ands or buts about that. I spent a lot of time with that album. I haven’t come close to tiring of it. I pestered Clint for a schedule for his next album. It took awhile, but finally, The Clint Hoover Trio’s On This Day is here and it is more than worth the wait. It is jazz triumphantly spilled through a harmonica by a sensitive, imaginative, assertive artist. This new Clint Hoover Trio album features Clint on chromatic harmonica with a taste here and there of some hot diatonic work. David Hupp is on piano and Eric Graham is on upright bass. “What, no drums?” Clint said he didn’t need drums. Come to think of it, with this trio, I didn’t miss them either. These three guys make a big sound. Try as I may, I can’t come up with a favorite from the song list; they are all equally riveting jazz performances. True, a number of the selections are not familiar to me, but that’s just me. What I have missed out on doesn’t dampen my experience of them. On This Day kicks off with a cool Dexter Gordon piece called Cheesecake. The trio establishes the theme, then Clint and the guys jam for a swinging 6 and a half minutes, a great way to launch off an album. Next is the Toots Thielemans classic chestnut Bluesette. The top of their arrangement seems to have nothing to do with the familiar theme, but soon does a really classy transition that reveals Bluesette. Nicely done guys! Then the group spends the next 10 minutes jamming their hearts out on Toots’ masterpiece. I think Toots will love it. Lament from J.J. Johnson is a change of pace that allows Clint to show off his great phrasing and feel for a captivating ballad. It’s really pretty stuff that flows for 9 and a half minutes. It’s a special musical treat. Off we go with a hot arrangement of a Horace Silver piece called Sister Sadie, this time with Clint riffing his diatonic harp. It’s hot stuff for sure. The jamming continues with Witch Hunt from Wayne Shorter: another 10 minutes of neck thrusting, toe tapping chromatic harmonica jam. It’s jazz, jazz, jazz. Did we think that Clint would leave out the blues? Well, he doesn’t. Moe Kauffman’s Swinging Shepherd Blues is the choice. More diatonic harmonica? NO! It’s back to the chromatic for Clint, a gutsy decision considering the diatonic is the norm for blues. With Clint in charge, the chromatic works for me. Always leave ‘em in a happy musical mood is the rule. And happy it is with Clifford Brown’s Joy Spring. I’m writing this review at 3:10 a.m. Clint, Eric and David are wailing on this swingin’ piece that is going to send me strutting my way upstairs to bed as soon as I cap off the joy of having had this album playing behind my typing, motivating the tempos of my key taps. If you are a jazz nut, especially a harmonica jazz nut, there is no way you should miss out on this album. The Clint Hoover Trio is as good as it gets, this album, On This Day is an absolute must. It’s a jazz offer you can’t refuse. 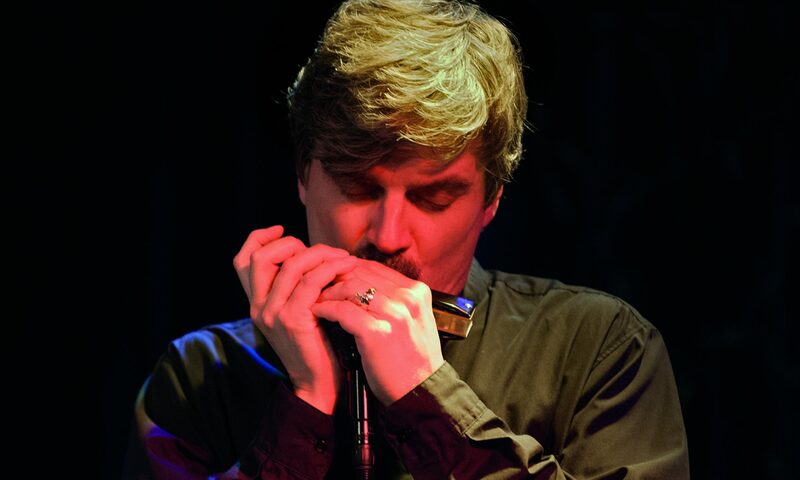 Clint is a harmonica player and teacher from Minnesota, USA. He began playing the diatonic over thirty years ago, and he played in a series of bands from blues to the more jug band inspired Sugar Kings. He started playing chromatic early in his career and it led to him studying with Robert Bofiglio and his enrollment in a University Jazz Course in NY. This CD show him in his preferred acoustic setting with excellent contributions from piano and bass. It is a trio album where all the instruments get some space — it is not a harmonica album, although it is built around Clint. The music wins and for me that is a nice trip through my old Blue Note LPs, which is where much of the music was drawn from: Dexter Gordon, Wayne Shorter, Horace Silver, Clifford Brown, J J Johnson, plus Toots. Just what you need when you want an hour or so of relaxed bluesy jazz harmonica from one of the best players around. On this latest offering, Clint Hoover finally steps out of the role of sideman and easily slips into a leadership position. His concept was simple: to capture a spontaneous, off the cuff session in the spirit of the great Blue Note jazz recordings of the 50’s. He hand picked classic jazz compositions by such luminaries as Dexter Gordon, Wayne Shorter, Clifford Brown and, of course, Toots Thielemans. It was recorded in one day (hence the title), and is ‘live’ in the studio. There is little, if any, preconceived arranging. The results are fresh and exciting. One listen will reveal that Clint has not been resting on his laurels as an improviser on the chromatic harmonica. His melodic and harmonic ideas have expanded and matured. His tone and execution is smoother, subtler, and more expressive. On a hot version of the Horace Silver composition, Sister Sadie, Clint demonstrates his versatility by playing jazz diatonic harp. Although he leads the project, it is definitely an ensemble effort. Eric Graham plays the bass with authority and grace. David Hupp plays the piano with great sensitivity. Collectively, there is excellent interplay between the instruments and a keen sense of dynamics, space and texture. All three musicians are great ‘listeners.’ The CD was recorded at Wild Sound Studios, which is widely known as the place to go in Minnesota for superb sound when recording acoustic jazz. All in all, this is a fine debut for Clint as a leader. It’s also a thoroughly satisfying experience for the listener, leaving you with a sense of anticipation for Clint’s next solo outing.